A cold war between ODM and Ford K parties in Bungoma over seats. - Bana Kenya News, Real African Network Tubanane. Home News A cold war between ODM and Ford K parties in Bungoma over seats. 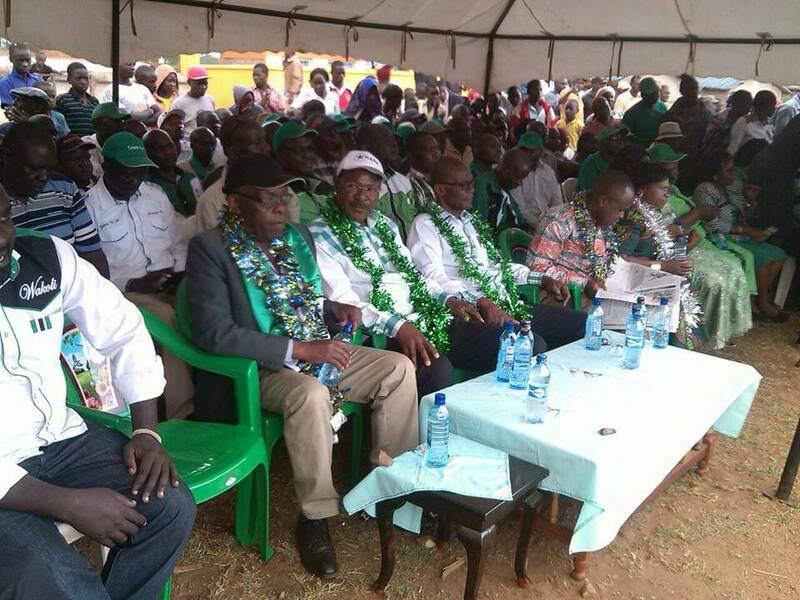 A cold war between ODM and Ford K parties in Bungoma over seats. Trouble in Bungoma after the Ford Kenya delegates storm their leader Moses Wetangula for being in NASA. The leaders wanted to know why the ODM party aspirants are not resigning for their candidates as agreed in the MoU. The leaders claim that the Bungoma senator Wetangula sacrificed his bid for the ODM leader Raila Odinga and now they said that they want the ODM leader to reciprocate through the ODM aspirants in the county to step down for their colleagues in Ford Kenya. Wetang'ula, Raila, Kalonzo Musyoka (Wiper), Musalia Mudavadi (ANC) and Isaac Rutto (CCM) joined forces to form the National Super Alliance. Raila and Kalonzo will take on President Uhuru Kenyatta and DP William Ruto in the general election on August 8. Wetang'ula's party has insisted the county is purely its zone and that orange party candidates should be locked out. But ODM does not seem to want to cede. "We made sacrifices as a party and our leader stepped down for Raila's presidential bid. What is so difficult in them sacrificing Bungoma seats for us?" said Kanduyi MP Wafula Wamunyinyi and the Ford Kenya's Bungoma chairman. "We are going to make a major statement...ODM aspirants should step down," he added. "Let's face the reality that unless we create order, we will lose many seats to Jubilee," he said. "This man, together with his party leader, must be out of their minds. We have invested as candidates....how do we step down?" said ODM Bungoma county secretary Majimbo Okumu while laughed off Wamunyinyi's far-fetched assertions. The underground war has hit in the area between the ODM party and Ford K. The war is about Ford K being a stronghold, ODM to let all seat to them. Up to date, the ODM party has not issued any statement regarding the troubles in western Kenya.